GREETINGS RESEARCHER, and welcome to Prostate Insights! This publication is full of information concerning issues that surround prostate cancer. When dealing with a cancer diagnosis, the main focus is usually the cancer itself. While deciding what treatment to choose, patients may overlook critical issues; issues that most are not prepared to tackle. Prostate cancer treatments have side effects that can undermine intimacy in relationships, and some can cause fatigue that can limit one’s ability to live a normal life. Many times men do not talk about the symptoms of advanced cancer that they are feeling, and as a result do not get the support and care that they need. There are even some uncommon but very real emergencies that patients need to be aware of when dealing with advanced cancer. Thankfully, we have experts to address these problems. Additionally, the authors featured in this newsletter will be speaking at our 2016 Prostate Cancer Conference next month, if you are interested in pursuing these topics in greater detail. Patients often feel reluctant to talk about the issues that affect them. 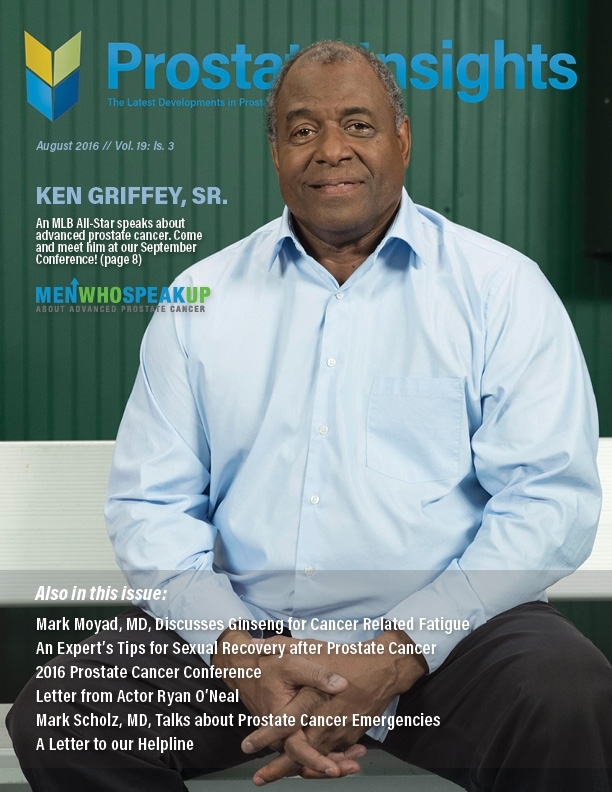 Addressing this issue, Ken Griffey Sr., a three-time MLB All-Star and spokesman for the Men Who Speak Up program, encourages men with advanced prostate cancer to learn about the symptoms of progressing disease so they can receive necessary treatments. In his article, Mr. Griffey shares his personal story dealing with prostate cancer. At our 2016 Prostate Cancer Patient Conference, he will cover available resources that can help men be more forthcoming about their situation. Mr. Griffey is also looking forward to greeting patients at the Men Who Speak Up booth directly after his presentation. Also in this issue, Mark Moyad, MD, an expert on diet and supplements, shares an effective natural solution to cancer-related fatigue using ginseng. Ginseng has been shown to counteract fatigue in multiple clinical trials. Dr. Moyad explains these trials and their effects in his article. For those who want additional information, Dr. Moyad will be covering the topic of diet and supplements at the 2016 Conference. Sexual dysfunction occurs commonly with prostate cancer treatment. This problem must be recognized as a couples’ disease, as it affects intimacy and can stress relationships in unexpected ways. Dr. Erica Marchand, a practicing therapist who specializes in sexual intimacy after cancer treatment, shares nine practical tips to help you and your partner build intimacy in the wake of cancer treatment. Dr. Marchand will also be leading a Sunday breakout session on correcting sexual dysfunction function at the 2016 Conference. Lastly, prostate cancer specialist, Mark Scholz, MD, highlights rare but significant emergencies men with prostate cancer can potentially face. Men with metastatic prostate cancer and their caregivers need to be aware of these issues. Near the end of this issue, we have published a letter we received from a prostate cancer caregiver which highlights the impact of the PCRI’s free Helpline. As you read, you will discover that you are not alone in your battle against prostate cancer and there are numerous resources available. We encourage you to keep researching. There are many things you can do to maximize your quality of life and your relationships.